These camp badges are available only from Norfolk Scouts Trading Post and you can find out more here. There is a series of four challenges for each section covering Beavers to Explorers (Network are also welcome to participate and can pick from any of the challenges). The challenges are designed to be undertaken in order through April, May and June with the final challenge in July/August. Although if it suits your sections programme, they can be done in any order. The programme team would love to see how you are getting on with the challenges, so please feel free to post your pictures on the Norfolk Scouts Sharing Centre on Facebook, or on social media, sharing any feedback with us. 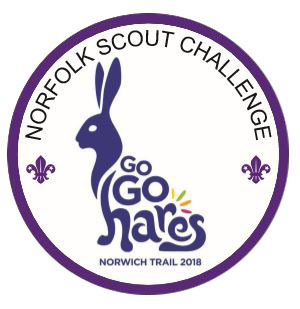 The final challenge for each section is to visit the Go Go Hares Trail. As we appreciate not everyone is able to come to Norwich, we have arranged an alternative fundraising challenge for Break, that can be undertaken by each section.